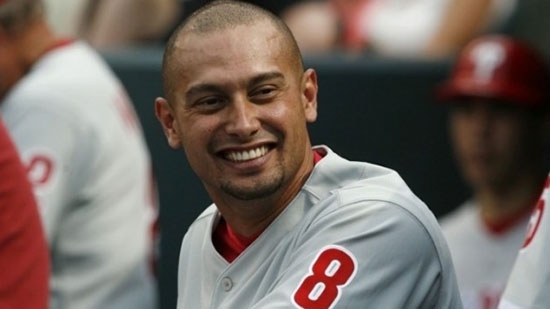 iradiophilly | Sports - Former Philadelphia CF Shane Victorino Will Retire as a Phillie in Ceremony on August 3rd. Former Philadelphia CF Shane Victorino Will Retire as a Phillie in Ceremony on August 3rd. Former Philadelphia Phillies' center fielder Shane Victorino, the "Flyin' Hawaiian," announced via Twitter that he was retiring from baseball. He said, "Mahalo BASEBALL. I hope I made you all PROUD." Victorino was a Rule-5 draft pick for the Phillies in 2004 and played from 2005-2012, including the 2008 World Series Championship. He won three NL Gold Glove awards and was named to two All-Star teams. Victorino was also a member of the 2013 World Series Champion Boston Red Sox and won an AL Gold Glove. He played for the Philadelphia Phillies, Los Angeles Dodgers, Boston Red Sox, the San Diego Padres, the LA Angels and the Chicago Cubs. Victorino will sign a 1-day contract with Philadelphia and retire as a Phillie at a ceremony on August 3rd during Alumni Weekend.